Dr. Sorokin is a professor of Pathobiochemistry and Director of the Institute of Physiological Chemistry and Pathobiochemistry at the University of Münster. Dr. Sorokin joined nPOD in 2010. Tell us about your education and background – where are you from, where did you go to school? I am from Australia and did my undergraduate studies at the University of Western Australia in Perth, majoring in biochemistry, physiology and zoology. After completing my PhD in 1987, I moved to the Max-Planck Institute in Tuebingen, Germany, to learn more about developmental biology- a topic that had always fascinated me, but was, at that time, difficult to study in Perth. Tuebingen was and still is the home of the Max-Planck institute for developmental biology, where many important fundamental discoveries in the field of developmental biology have been made. It was during this first postdoctoral period in the lab of Prof. Peter Ekblom, that I discovered extracellular matrix and started my work in this field, studying the role of cell-matrix interactions in kidney development. I carried out a second postdoctoral period from 1990-1991 at the Max Planck Research Group on Extracellular Matrix and Immunology in Erlangen, Germany, where my interest in immunology was awakened. My intention was to get a few good papers and to head back home to the beaches and sunshine in Perth; however, it was in Erlangen that I met my husband, which has resulted in a detour from the way home (at least for a while). It was my husband, Rupert Hallmann, who is also a scientist, who taught me about the complex steps involved in leukocyte diapedesis and got me interested in leukocyte trafficking. Erlangen was a very good period for both me and my husband – we were fortunate to be in the department headed by Prof Klaus von der Mark, a very clever matrix biologist with enormous enthusiasm for his work, who allowed us every freedom to pursue our interests. In 1992, I obtained my first grant from the German Research Foundation within a priority programme (Schwerpunkt) entitled ‘Cell-Extracellular Matrix Interactions in Development and Disease’ that was instigated by Klaus von der Mark and provided me the contacts with other matrix scientists that has been fundamental to my career. In 1999, I obtained my first junior professorship at the University of Erlangen, and in 2001 I was awarded a Senior Research Fellowship from the Swedish Research Council and moved to Lund, Sweden, to take up my first full professorship, together with my husband who also was also awarded a professorship at the University of Lund. Since 2005, I am Professor of Pathobiochemistry and director of the Institute of Physiological Chemistry and Pathobiochemistry at the University of Münster, Germany. It was in the years in Erlangen and, subsequently, Lund that I became increasingly more intrigued by the question of how immune cells can penetrate the tight protein network of basement membranes. The 1990’s had seen the discovery of many molecules essential for leukocyte rolling, adhesion and migration across the endothelial monolayer of the blood vessel into inflamed tissues, but the whole world seemed to have forgotten that underlying the endothelium was a second barrier, the basement membrane. Where do you currently work and what is your position? What does a “day in the life” look like for you? I am a Professor of Pathobiochemistry and director of the Institute of Physiologcial Chemistry and Pathobiochemistry at the University of Münster, Germany, and I am involved in both research and teaching. We are a preclinical department responsible for teaching biochemistry to medical and dentistry undergraduate students. Our research is focused on the extracellular matrix, in particular basement membranes, blood vessels and immunology. The types of questions we address are: how do basement membranes differ between tissues, how do different immune cell types penetrate basement membranes, how do basement membranes impact on blood vessel function (both endothelial, pericytes and smooth muscle) and how does the specialized extracellular matrix of lymphoid organs impact on their function. My role is to guide the younger members of the group in their careers, to provide the infrastructure and funding that permits them to work as well as possible, and of course to teach them about the extracellular matrix and why it is important to understand its structure and function. Much of my work also involves travelling to report on our results to other scientists and promoting extracellular matrix research and, more recently, setting up research networks to promote interdisciplinary work and clinical translation of basic research www.cells-in-motion.de. Why diabetes? 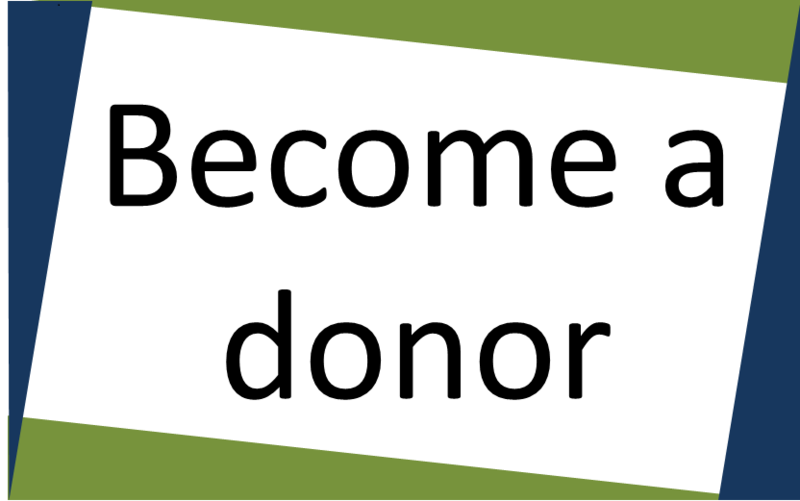 How did you get involved in diabetes and/or what made you want to work in diabetes research? A large part of the work carried out in my lab revolves around the question of how immune cells penetrate basement membranes. Most of this work has been carried out in the brain where blood vessels are ensheathed in two separate basement membranes (an inner endothelial basement membrane and an outer parenchymal basement membrane), which are important for the very restricted permeability of brain blood vessels (the so-called blood-brain barrier). Due to this specialized structure, infiltrating immune cells get trapped (for up to several days) between the 2 basement membranes and it is therefore easy to identify precisely where leukocytes have penetrated the endothelial basement membrane and to study this process and the mechanism/s involved. The model that we employed is known as experimental autoimmune encephalomyelitis (EAE), which is a common model for the autoimmune disease, multiple sclerosis. I got involved in diabetes through a good friend and colleague, who I met during my years in Lund – Susanne Cardell. Susanne is an immunologist interested in NK T cells and their role in T1D, in particular, the induction of disease and the onset of symptoms. At that time, it was known that when leukocytes remain outside of the pancreatic islets that disease is not induced, even in the presence of massive peri-islet leukocyte infiltration, suggesting that something at the islet border was acting a disease-limiting factor. 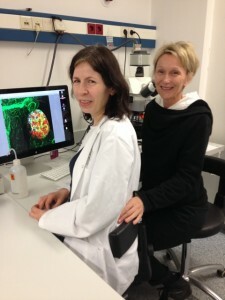 It was in discussions with Susanne, during the long dark Swedish evenings, that we started to ask whether the peri-islet basement membrane could be such a factor, whether the peri-islet basement membrane was biochemically the same as that found in blood vessels of the brain, and whether leukocytes in the pancreas could be using similar mechanisms to those used to penetrate the brain blood vessels. It was the start of a very fruitful time for me, where I learned a lot from Susanne and had a lot of fun doing so. This is where Eva Korpos enters the story – Susanne and I had just gotten funding for a joint project from the Juvenile Diabetes Research Foundation (JDRF) when I was offered the Chair in Muenster. Eva Korpos joined the lab shortly after my move to Münster and has been the driving force behind the project since that time. Basement membranes are thin, protein sheets that occur in all tissues of our body – the proteins that constitute basement membranes are highly specialized, being very large and insoluble – they therefore naturally build stable and flexible networks. The best example of the function of the basement membrane is our skin; the reason you cannot pull your skin off is because the skin cells (epithelial cells) are bound to the basement membrane. However, you can stretch your skin considerably, showing how flexible the basement membrane is. My group is interested in the proteins that make up the basement membrane – their structure, how they interact with each other and how they interact with cells, and how this impacts on the function of an organ/ tissue. The tissues we examine are mainly blood vessels, in particular in the brain, but also lymph nodes and spleen which contain specialized basement membranes. In the pancreas, there is also a specialized basement membrane that encapsulates the insulin-producing beta-cells, that is called the peri-islet basement membrane. Eva Korpos, a senior scientist in my lab, has recently published in the journal ‘Diabetes’ that the peri-islet basement membrane acts as a barrier to leukocytes infiltrating the pancreatic islet, much in the same way as occurs in the blood vessels of the brain. However, her work has also shown that basement membranes are biochemically different, depending on the tissue examined, and that the peri-islet basement membrane is distinct from that underlying the endothelial cells in blood vessels of the brain. This biochemical distinction confers both the physical characteristics of the basement membrane and its biological function. Eva Korpos’s work has provided the first comprehensive description of the major extracellular matrix molecules associated with the peri-islet basement membrane and has shown that all basement membrane components are lost at sites where leukocytes penetrated into the islet. The protease enzymes involved in this process have been identified and her current work aims at targeting these proteases to define an image-based screening strategy to identify ongoing inflammation in the pancreas and, thereby, disease progression, as well as novel therapeutic approaches for limiting disease progression. What are your thoughts on the progress being made in T1D research as a whole? Progress in T1D research has been given directions through the introduction of new topics to the field, like that of the extracellular matrix and the role of proteases, but also new technologies such as optical imaging. High sensitivity and high resolution 3D analyses of interactions between pancreatic cells and their environment or infiltrating immune cells have revolutionized our understanding of islet structure and function, and have identified new areas of research relevant to T1D progression. The valuable tissues provided by nPOD permit for the first time validation of data from work in animal models on human tissues, which has strengthened research enormously and increases the chances of clinical translation. However, there are many questions to be answered, many of which require investigation of the early, critical pre-symptomatic stages of the disease, which emphasize the need to expand human tissue collections and to support organizations like nPOD that provide highly professional sample distribution and coordination of the data obtained from the samples. Why is diabetes research so important? T1D only becomes apparent when 90% of the islets have been lost due to immune cell infiltration of the islets and destruction of the beta-cells. It is therefore crucial to understand all the steps that lead up to this stage, but also processes that may be able to preserve remaining beta-cells or promote their survival (eg after transplantation). This is possible only through animal models where induction of the disease can be synchronized to a certain degree. However, validation of the data in human samples is crucial. To be able to understand how to slow T1D progression or to treat the disease we have to understand organ function in all its complexity. This means that not just one avenue of research is important but many and that the integration of this knowledge is fundamental to progress. Do you have anything extra you would like to share? Is there anyone to thank or acknowledge? I have been fortunate to have generous colleagues and good friends amongst my colleagues, as well as dedicated and conscientious postdocs and students without whom all the many years of work would not have been possible. I am grateful to the extracellular matrix ‘family’ who has provided tools and advice, funding bodies like the German Research Foundation, JDRF and EFSD who have provided the means to carry out these studies, and to nPOD who provide the valuable tissues for validation of our data and, thereby, increase our chances of clinical translation of our results. I like swimming and the beach (when I can get to it from central Europe! ), I escape stress through reading and hard physical work in the garden. I get my strength and energy from my family, my friends and from music.